The Easiest Pot of Beans. Ever. And they taste fantastic too. Above is seriously one of the easiest dinners you could make this week. or ever. The beans involve just two ingredients, if you don’t count the seasonings, and take just a couple of hours on the stove (no soaking)! Anything you don’t eat in the first couple of meals, you can make into refried beans for another meal, or freeze for later. When I was a kid in the rural town of Coarsegold, just below Yosemite, Pinto Beans were a common fare at our house. Plain and simple, usually hit or miss with taste. If the power went out we knew we were having beans for dinner that were cooked in a pot on top of the wood stove. I make it seem like I lived in the boonies somewhere, but we had a couple neighbors. And deer. And coyotes. And mountain lions. I honestly haven’t made a pot of pinto beans since living at home. Mom: Do you guys need us to bring anything up when we visit? Me: I don’t think so, just that photo from your photo album that you probably don’t want because the head is awkwardly chopped off. Mom: (as she’s laughing) Why do you want that picture? Me: I don’t know I have a thing for those types of pictures. In a non creepy way. Mom: Okay. Well I’ll bring up all my photo albums because I don’t know which photo you’re talking about. I’ll set it next to those IKEA table legs and some supplies for your sewing machine. If I brought you guys up some Pinto Beans would you eat them? Me: I guess, are they dried? Mom: Yeah, I bought a 25 lb bag at Costco last time we were up there. Me: Why did you buy a 25 lb bag of pinto beans? Mom: I thought they were a good deal. Me: That makes total sense. Mom: So I took the bag and portioned it into gallon size ziploc bags, I think there’s about 4 lbs in each bag. Do you want one or two bags? Me: Please only bring one. Moms; You gotta love ’em. I seriously really love mine. And her Pinto Bean buying abilities. Back to the easiest pot of beans: I found the recipe after a google search brought up Ree Drummond aka Pioneer Woman, who can do no wrong. I read through the beautifully written post and then was baffled at the fact there was only two ingredients and no soaking? This has to be sacrilegious, right? Is someone hiding in one of my cupboards to watch me cook the beans and then Punk me after the 2 hours of cooking to only tell me they’re nasty and I’m a fool? Ashton Kutcher you are not allowed in my kitchen. I went for it though. Beans and bacon, in a pot for 2 hours. I threw in the seasonings and then was punched in the face by the simplicity of these beans, and how these beans, with a bunch of toppings could be an awesome dinner for a small group of people. I chose to eat them with some crumbled cotija cheese over top with cornbread, and a couple days later enjoy some avocado on them. But the toppings are endless: (treat it like a bowl of chili) Sour cream, greek yogurt, almost any kind of cheese, chorizo, Sriracha, jalapenos, etc. These beans really are a blank canvas for anything, including hot dogs that Steve wanted to mix in. Because that’s how he had them as a kid. And lastly, before I give you the recipe: There are a lot of cornbread recipes out there. A lot of them involve a hot cast iron skillet. I have yet to buy one of those. I found an old recipe I used to make as a kid for beans like this, off the Alber’s cornmeal box. One of my sister’s friends told me it was the best cornbread she ever had. So, there you go. Easiest Pot of Beans. Ever. Place beans in a colander and rinse under cold water and sort out any small stones or deformed beans that might have made their way into your 25 bag. Put in a large stockpot or dutch oven and top with water to cover 2-3 inches. 12 cups did the trick for me. Once the water’s in there, stir the beans and watch for the ones that float to the top. These are gross shriveled beans that won’t help out the flavor train at all so grab them out. It might take a few turns to do this, and should only be a couple of Tablespoons. Turn the heat on medium heat and slice up the bacon. Add it to the pot. Bring the beans to a boil, uncovered, then reduce to a simmer, put a lid on it and cook for 2 hours. DO NOT season before cooking. After the 2 hours is up, throw in all the seasonings and season further if needed. I used pepper bacon so I lowered the pepper Ree used for her beans, so you might need more. Serve with a variety of toppings to make even more delicious. Whisk all the dry ingredients in one bowl. In a large measuring cup, measure out the milk and add all the wet ingredients, mix to combine, then add to dry ingredients. Mix to just combine, fold in optional add-ins if using and put into prepared baking dish and bake for 18-22 min until sides are pulling away from the dish and a toothpick inserted comes out clean. *Optional Add-ins: Just like the beans, this a blank canvas that’s great by itself but also with some additions, try about a cup of sharp cheddar, a minced jalapeno, some green onions, or some chorizo. Yep. I really want these in my life. 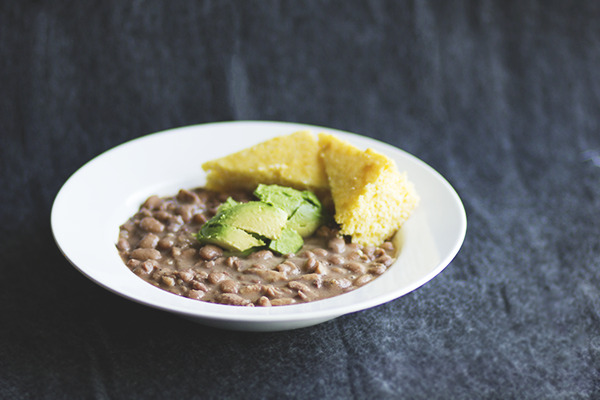 And you had me with cornbread and avocado. Totes put them in your life Megan. And Avocado and cornbread make everything better, it’s a scientific fact. My mom buys 20lb bags of popcorn at costco…moms just know about bulk-buying. Dried-beans are the business! Haha, I believe the term is “momming it up”. Go Moms! Sorry to hear you don’t like bacon!